Welcome to the South Australian Railway Modeller’s Association website. We would like to invite you all to our open day on Sunday 28 April, 10.00am – 3:30pm. The log cabin and the sheds will be open to view our clubroom layout, our award winning exhibition layout ‘Strathburn‘ as well as club member layouts, modelling how to’s and more. Visiting members of the public will be asked to make a gold coin donation to help with the cost of hiring the log cabin and to supplement the building fund. Strathburn was exhibited at the Adelaide Model Railway Exhibition in June 2018. The next exhibition in 2019 will be held on the Queen’s Birthday long weekend, 8th, 9th and 10th of June. Adults $15, concession $12, children 5+ $7 and family ticket $32 with proceeds to the Make-A-Wish foundation. Local and interstate layouts and traders as well as a well stocked 2nd hand stall will be available. 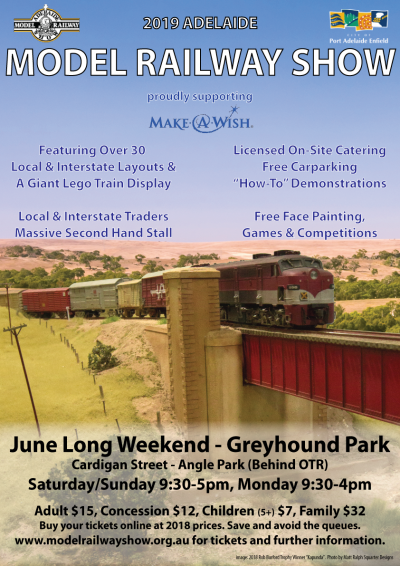 More details will be available at the AMRE website www.modelrailwayshow.org.au. We look forward to seeing you there. Currently, SARMA has over 100 members including some interstate. Visitors are welcome to attend our work/modelling nights which are held on every Wednesday evening of the month (from 7pm). Work nights currently involve building our exhibition layout, building various models either from kits or from scratch or a combined club project. Another occasional activity, and one which is expected to increase, is the installation of DCC decoders. Visitors are welcome to attend several meetings to determine whether SARMA is the club for them, before being expected to join. We hold our monthly General Meetings on the 2nd Wednesday of each month (except December) at 7.30pm. The formal part of the meeting is followed by some sort of activity, frequently a visiting speaker who speaks and shows pictures on a particular topic. Members are invited to bring models pertaining to the speaker’s subject, where appropriate, or simply models in general. The normal attendance is around 40 members but, occasionally, it gets closer to 60. 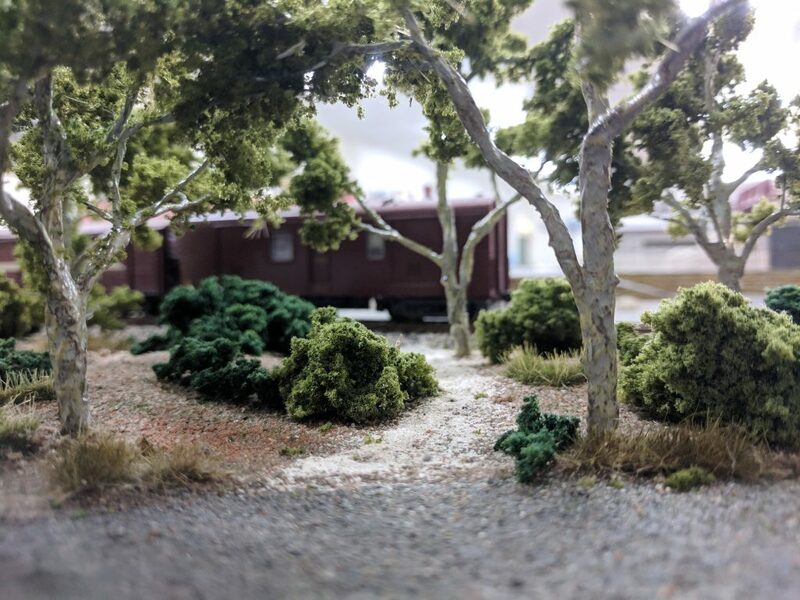 SARMA has two model railway layouts for exhibiting, the award winning DCC HO Scale Exhibition Layout, ‘Strathburn’, and an N scale modular T-Trak layout, ‘Rails to Morgan Wharf’. A new HO scale clubroom layout has been started and is progressing well.SARMA members also built and operate a layout at Wayville Showgrounds for the Royal Adelaide Show in September; this is the only time that this layout operates. Social events include a birthday dinner held in May, a Christmas dinner held in November and a mystery event held on the second Wednesday in December in lieu of the General Meeting. See the Social page for more detail of these and other events. Don’t forget to check the Social and Events pages for upcoming functions, exhibitions and events that the club is involved or invited to!